So outside of work and my social life (which I keep private), this leaves me a lot of time to think up ideas. I’m almost certain about the idea of starting to write short story Ebooks for Kindle (and the Kindle App on iPhones). I’m already learning about the recommended format (pdf) and the easiest writing software to convert to it in order to easily transition any work into Ebook form (from what I can tell it is Open Word). I have started picking up some old horror and fiction books from my childhood to get inspiration and ideas on the style of writing, number of chapters, number of pages per chapter, etc… Little technical things I would like to have a guideline on before I start writing. 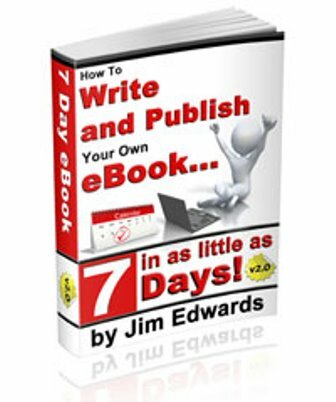 This is why I am currently reading the book “7 Day eBook V2.0” by Jim Edwards. I love writing, so I’m really hoping I can develop my technique to create some fun content. Currently, I’m going to start a personal goal to read as many fun books from my childhood as I can so that I can put myself back into the mentality of what I loved about books when I was younger. No promises, but hopefully if I follow through with this I can have enough experience to help anyone else that also loves to write, but is intimidated by all the stigma there is against getting started. I think the hardest part is putting your own material out there after all the editing and getting someone to make a cover picture (gah, the cover picture may very well be the absolute most important thing about any book from a business perspective at least) and that fear that someone will hate it. Anyway, just updating you guys about some real stuff going on in my life and some ideas I have.